It's always refreshing when you get the opportunity to work with people that love the coffee industry and want to make it better for the coffee drinker. Goat Story are one of those companies that want to make coffee a unique experience. Goat Story is a young team from Slovenia that created the super successful horn shaped travel mug. The unique shaped mug was successfully backed on KickStarter back in 2015. Now the team have branched out and have created a beautiful hand crafted pourover maker called the G-Drip. 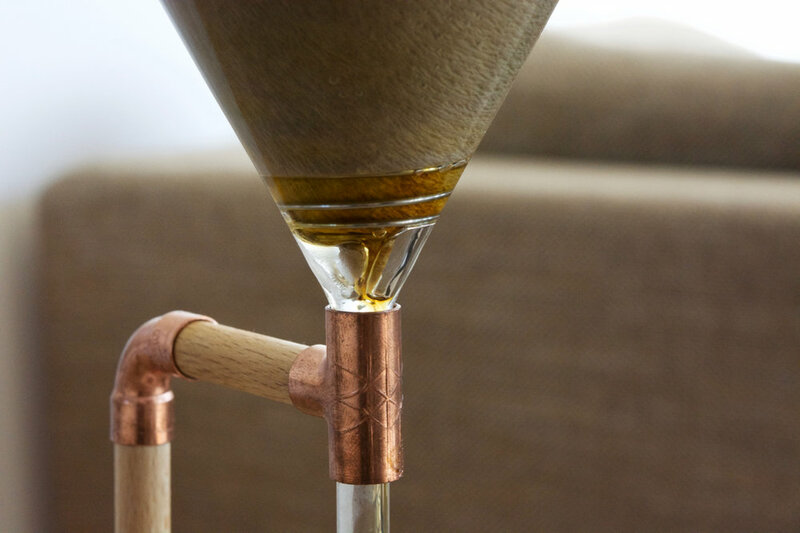 The minimalist design of the G-Drip is made with simple materials of wood, copper and glass. It is compact and aesthetically pleasing to have in your home. The contrast of the copper fittings that connect the wooden lengths with a glass funnel cone makes this piece pop without being too fancy. The G-Drip has a special spring that makes the brewing device unique. The flow spring sits at the bottom of the heat resistant borosilicate glass funnel. The flow spring allows for a better extraction and prevents an over-extracted coffee. I tried brewing a coffee without the flow spring just to see how it compared. It just didn't work. The brew was about 2 minutes longer compared to the brew with the flow spring. A 250 millilitre (it can go up to 300 millilitres) flask-like vessel sits at the bottom of the G-Drip catching your brew. Hario V60 filter papers work well with the pourover maker. The G-Drip also comes with 10 filter papers so you can start brewing immediately. The other plus for the pourover maker is that it's light (310 grams) and sits well on brewing scales, making it a treat to work with. The G-Drip arrives in a sealed elegant black box with a user information booklet. Content Manger Dunja Kristan hinted that for the past year they have been in the process of crafting something very special. She stated it should hit Kickstarter in a few months. So stay tuned and follow their Instagram and website to see what's next for the young and innovative company.